The Xyron Adhesive Eraser Cube is designed to quickly and easily remove excess adhesive left by your xyron creative station or create a sticker machine. Dimensions: 0.5" x 3.87" x 5.37"
Amazing item comes in so handy in my card making. I do my best when making cards to not get the glue on my project. If it does happen, I let the glue dry and use this eraser to remove unwanted glue. Bought several to share with friends that enjoy card making. I love this and so do my customers! So glad I was able to find them!! This item is a must have for getting rid of "sticky" spots on paper crafts. 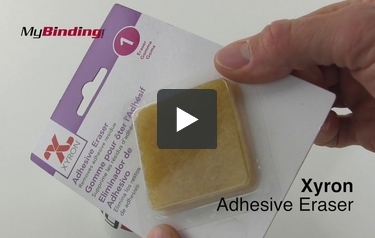 I really like this Xyron Adhesive eraser. It is a great tool for removing dried masking fluid from my watercolor paper. All the masking fluid was removed in seconds and soooo easy to use. I recommend this product to all artist as a must have Tool. Amazon delivered this product ahead of the scheduled time and I was very pleased with the shipping. Finally, after all these years of trying to rub off that little adhesive that was peeking out from under pieces on a cardfront, I invest in this little tool that does the job so great. It also erased some sort of smudge from a piece of cardstock that I was working with. Hello and welcome to MyBinding video. This is the Xyron Adhesive Eraser Cube. This cube was invented so that those of you who work with Xyron products and their adhesives can have an easy way to clean up sticky residue. And although it’s created for those products, I gave it a shot with some other things too, like my coffee mug and a sticker or a book and its price tag. Inevitably there’s sticky gunk stuck somewhere, right? Well this Xyron Eraser Cube might be a first line of defense. Just kind of like one of those big fat erasers you use on an art project, you use the same thing on your product here. You just rub, rub and rub it away. Now mind you, it’s not going to work everywhere on every kind of adhesive, but it’s a good start before you break out the chemicals. For more demos, reviews and how-to’s, check out MyBinding.com. Will these leave erasure looking marks on paper? There is not a solvent in the "eraser" it helps remove the left over adhesive with the rough texture if the cube. It should not leave any marks but you would want to be careful if it is being used with a uncoated paper because the friction may tear the page.